I have a laptop I just upgraded to Mint 19. It has an Nvidia GTX 960M in it, and I frequently use it with a second monitor. If there are two windows nearby, sometimes the borders expand to link up and overlap. Any ideas? Do you need more information beyond the inxi output below? Thanks. I am having the same issues with my ThinkPad T470s using Intel HD Graphics 520. It seems the issue only happens when I'm using multiple monitors. Can confirm the same issue on my quad display setup. 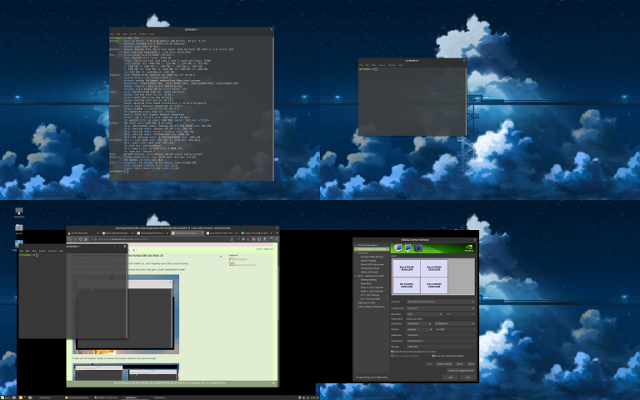 However, the issue only occurs on 2 of my 4 monitors, and seems to only affect the rendering of desktop wallpaper itself (windows and desktop icons always appear on top of the black boxes). Sometimes it flickers at the same rate as the redraw of the window. Workaround if the issue becomes too annoying (or flickers too much): You can use a 100% black desktop wallpaper to at least hide the issue (Can't see flickering black boxes on a black background). Not really a solution, but at least you can continue to use the computer without this issue distracting you. Workaround-wise, I'll maximize a terminal. I can confirm it only affects the desktop background. I would like to say that I am having this issue, exactly as described above. Black bars are confined to the desktop. Also noticing when changing wallpaper, that the image takes time to fully fill the screen, with similar boundaries to where the black bars appear. Unfortunately I am very new to Linux in general, so I don't have any solutions. I have the exact same problem. Flashing black borders or areas around certain windows. This solution also fixed it for me. This solution has been working so far for me as well. Thanks for the fix! Here's hoping it sticks. **EDIT** after re-installing video card drivers, this problem resurfaced. Had to re-apply the fix. Posting the fix here as well, in the name of redundancy. This forces any theme you use to have a 1 pixel border. You can use any value you want - for instance, use "0" for borderless windows. Then save the file and close all the applications affected by the black border bug (or you can log out and log back in), then try them again and you shouldn't see large black borders any more. After reboot. the issue still coming back. I have no luck in this. does anyone know which problem is this? nvidia? window manager? compositor? or cinnamon? so i can post a bug report to specific segment. i don't think it's nvidia specific problem. my friend got this issue too even though his card is AMD radeon. I am using the nouveau open source driver on a freshly installed Linux Mint 19 Tara with Cinnamon 3.8.9 and as soon as I connect my second monitor via VGA and open up a terminal window black boxes appear. They appear not only around the window but also as a flickering black box somewhere else on the screen. I created the gtk.css file but still black boxes appear. 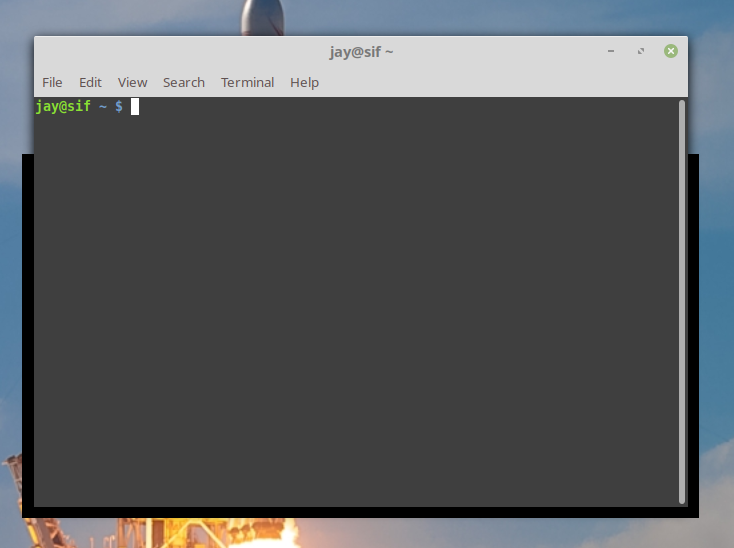 It seems that if I hover the window over a black box I can get it to disappear just for it to re-appear when I open more windows. It only happens when connecting a second monitor. No NVIDIA driver in use but the open source Nouveau driver. This did not happen with Linux Mint 18 or before. I still occasionally see the black boxes. I did last week. Before I mentioned that the gtk.css fix worked for me, but unfortunately that's not always true. Sometimes it works, sometimes it doesn't work. Unfortunately I have to return, as the result is not 100% working for me now. I get flashes like before, but they tend to go away whenever I do something in that monitor, like select or move a window. Also, now the flashes seem to be more random in where they occur, as opposed to being largely attached to windows previously. I did change my display driver from the nvidia 390 to the 396 (to play around with steamplay and proton), and that is where these problems re-appeared, regardless of the css fix from before. or if boot with both monitors at my desk on from the xorg file then it doesn't show up until i change displays with the script shortcut. Same problem here running LM under vmware fusion on a mac. The update to gtk.css worked up until the update today with a new kernel. Update: Although updating from kernel 4.15.0-43 to 4.18.0-13 (through the Update Manager this time, instead of doing it manually like I tried before) for now seems to solve the issue. I've had before that it seems to work for a while but comes back later, so I'm only cautiously enthusiastic.